Hooray! Guess who's finally back in the kitchen? 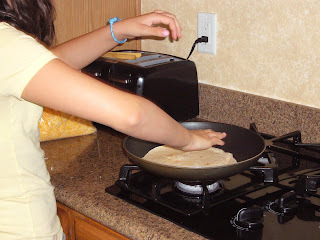 Sabrina is, and today she is making a quesadilla. She's enjoying the last few weeks of hot lunches, because once school starts, everything is either room temp or cold. There isn't a cafeteria at their school so they can have fast food delivered, but that's not healthy - so the kids are plotting their strategy for great lunches. 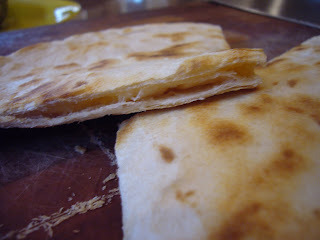 But on to todays lunch - the simple, yet always delicious quesadilla. 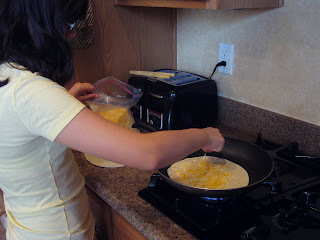 Then top the cheese layer with another plain tortilla, and allow to cook for a few minutes. 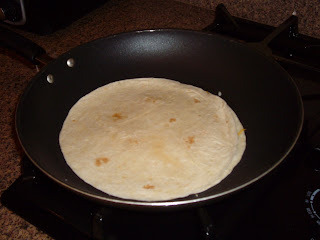 Flip it carefully, and allow the other side to cook for a few minutes, or until the cheese is melted and the tortilla is lightly browned. 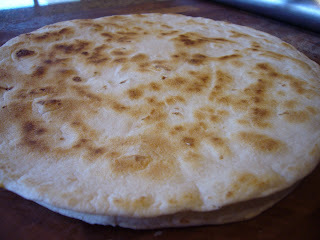 And cut into wedges. Serve with salsa, sour cream, and guacamole.